Special care and attention is taken during all of our moving and packing services that we provide. Moving day is, without a doubt, a stressful time. Whether your on the phone getting utilities turned on or off or dealing with you cable tv installation, we're there to take care of the rest! Triumph Moving & Storage Inc. makes moving day easy and sometimes even fun! Call today to receive your free estimate over the phone or in person. Above, Triumph Employees pause for a picture. Triumph Moving & Storage takes pride in our A+ Better Business Bureau Rating. We want our customers to feel "comfortable" with whom they choose to do business with! Click on the link above to review our status with the Bureau. 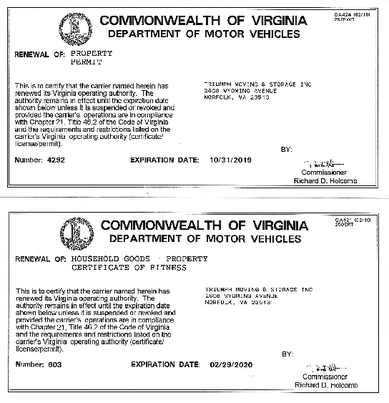 Triumph Moving & Storage Inc. is a member of the Virginia Movers and Warehousemen's Association. As an Active member of the American Moving & Storage Association, Triumph Moving & Storage inc. is always looking for new and better ways to serve our customers. Feel confident in knowing you are working with certified professionals in the Household Goods industry. Click on the Certified Moving Consultant Link for more information. Triumph Moving & Storage Inc. won the Angie's List Super Service Award 6 consecutive years! Thank you to all of our Angie's List customers who have called on us to make their move a success! Jukeboxes, Safes, Motorcycles, Pianos and More! 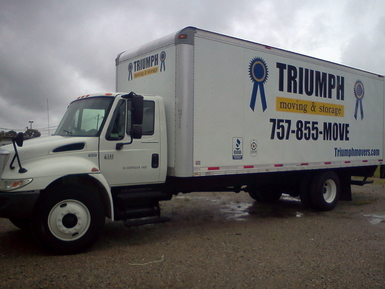 Triumph Moving & Storage employees work hard to see to it that each job performed is completed correctly. Each move performed is like a snow flake, no one move is the same. Our customers have different needs and different furniture. You have to come prepared. Tools, Blankets, Dollies, Straps, Muscle and most importantly a good attitude is what we bring to every job. Before we knock on your door, We're ready! With over 21 years of experience, Triumph Moving and Storage Inc. has established itself as a leader in the moving industry. 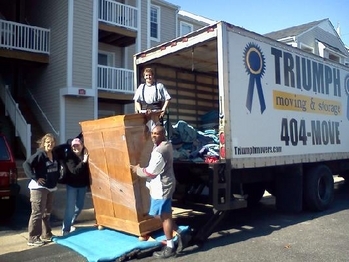 Triumph Moving & Storage Inc. continues to help individuals, students, families, seniors, military members, veterans and businesses with their moving, packing and piano needs. We offer a wide variety of moving and storage applications. Call us to receive a free estimate over the phone or in person today! Please review our SERVICES page to customize your move! Have you seen this quote driving down the road before? 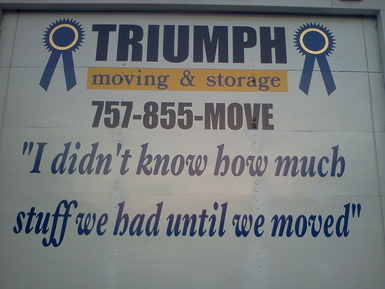 If you have, you were following a Triumph Moving & Storage Inc. truck! I can't tell you how many times we have heard this from our customers! Have you ever said this? CLICK on the facebook link to the left for more information and pictures about Triumph Moving & Storage Inc.
CLICK on the twitter link to the left for more information and pictures of Triumph Moving & Storage Inc.